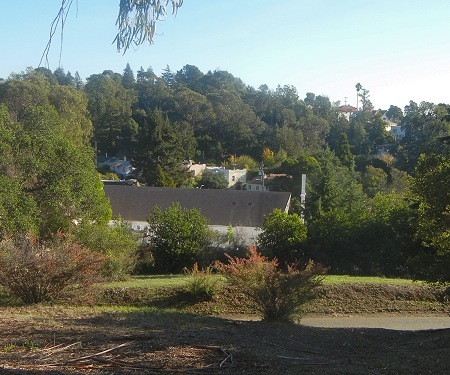 At the back of Mills College is a steep little hill called Pine Top. It looms especially high over Lake Aliso. The geologic map shows it as consisting of Jurassic basalt. 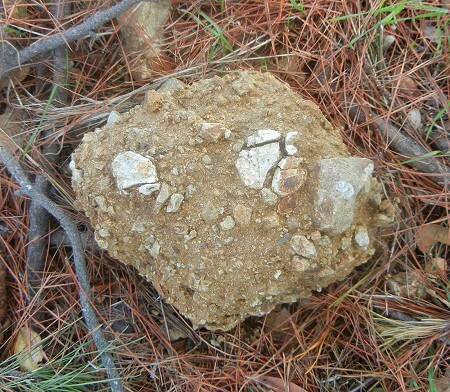 As I walked up Pine Top Road to reach it, I saw only what looked like nondescript sandstone, but I didn’t look closely. Rocks may be altered, and the Hayward fault running through here is notorious for swapping splinters of rock from one side to the other, so who knows. As you round the hill, the view opens across Seminary Avenue, which runs up the valley of Chimes Creek, to Millsmont hill. 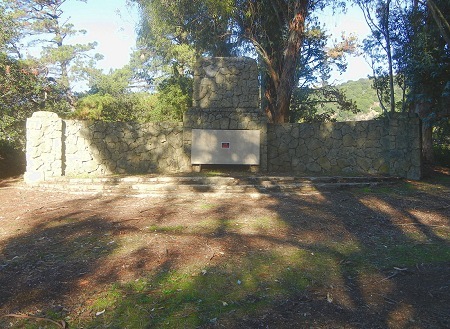 At the top is this big old stone stage, where it’s easy to imagine the young women of Mills assembling for all kinds of ceremonial occasions. What’s harder to imagine is the view that this place once commanded. All the trees are so mature, both pines and eucalyptus, that it’s frustrating. On the other hand, people live on all sides now, so privacy is more important. 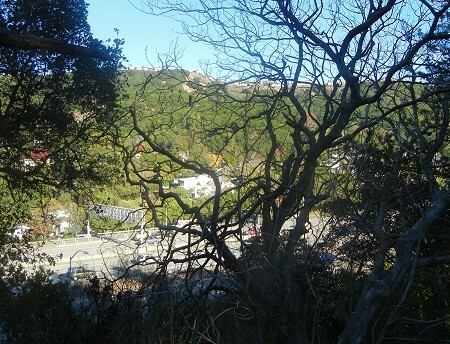 And the freeway behind the hill is so noisy that any ceremony you could think of would be spoiled by the din. As I said, there was no obvious evidence of basalt exposed along the road to Pine Top. So what was this lump of conglomerate doing there behind the stage? Just another reason to come back and poke around the flanks of this hill. This entry was posted on 20 January 2015 at 10:00 pm and is filed under Oakland conglomerate, Oakland geology puzzles. You can follow any responses to this entry through the RSS 2.0 feed. You can skip to the end and leave a response. Pinging is currently not allowed.